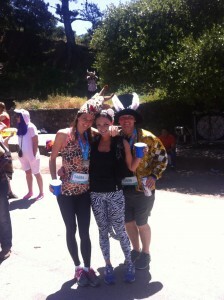 This weekend was Bay to Breakers (B2B). 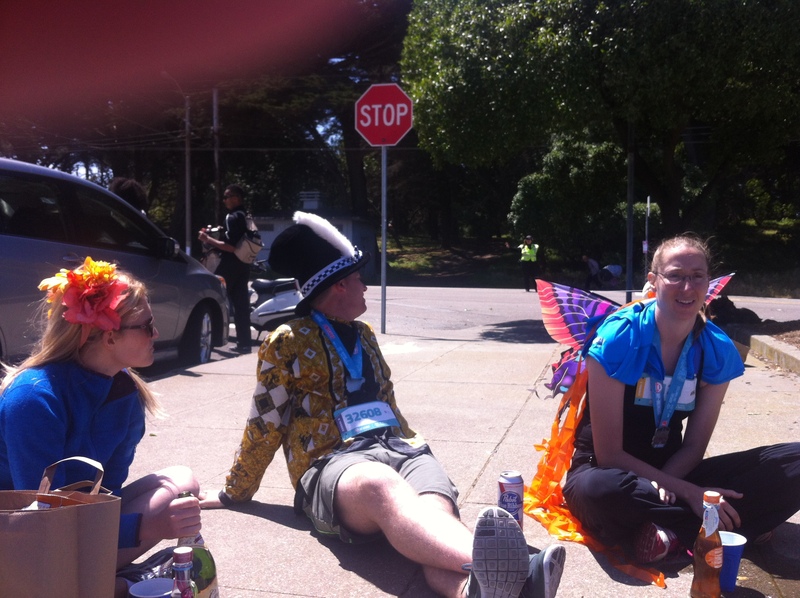 This is the world famous SF footrace. It is the oldest consistently run race, having been done every year for over 100 years. It is only 7 miles, so anyone can walk or run it. It is not the length of the race, nor the number of years run that makes this event special. It is the city of San Francisco and the people in it. 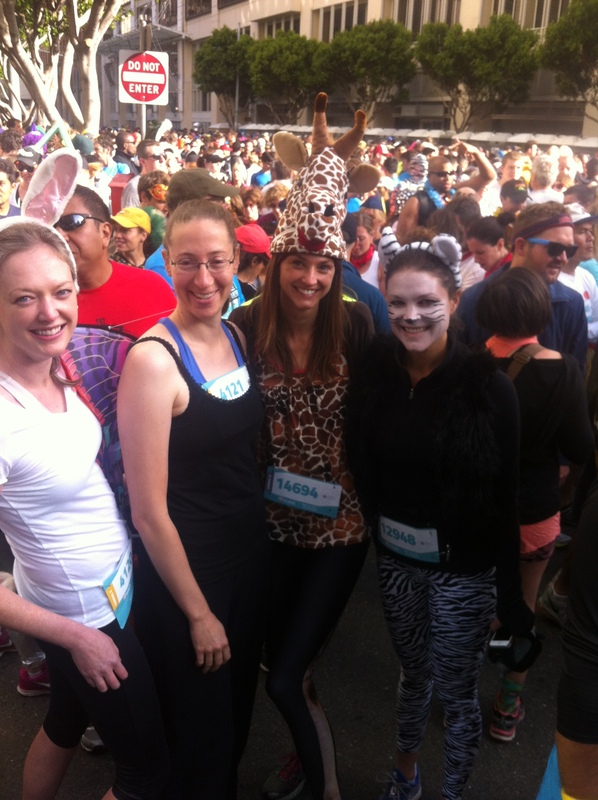 In true SF fashion, the race is less about running and more about the costume fueled seven mile party that the race becomes. The first group or two of runners are the serious running types that actually care about their times. After them come four more groups of people who couldn’t give two craps about their times, but are there to party and enjoy the company of the dressed up happy fools around them. I am part of this crowd. This year I ran the race with my housemate Susan, Katy, Evan, Katy’s bestie Diana, Diana’s fiance John and John’s buddy/business partner Arlan. The theme for our costumes was animals, though not everyone followed this. I was a bunny, Susan was a beautiful butterfly, Katy a giraffe, Diana a white tiger and Evan a magical unicorn with tiny blue wings. Evan won for best costume in our group. The race starts down by market street and the bay bridge. You then run up Post Street and the Hayes Street Hill. After that, the rest of the race is through Golden Gate Park and tends to have a slight downward slope until you hit Highway 1/the ocean. Overall it is not too bad, but the Hayes Street Hill is a little intense. I love B2B. It is always great fun. However, I must say that I am pissed at SF, as every year they try to ruin this major event. A few years ago, the city said no more floats and no more alcohol. The alcohol I understand. 50,000 drunken fools can be a bit of a hazard to themselves and others. Plus, if you really need some alcohol, you just stop at one of the hundred house parties along the route. The no floats thing is was really pisses me off. There is no reason for the city to out-law the amazing floats. Maybe they cost the city a little more to clean up, but then SF should just increase the cost of the race or charge an extra fee for floats. People would gladly pay. The floats used to be so amazing, they could put some major parades to shame. I hate that SF got rid of them and I wish they would stop being douche bags and just bring them back. Everyone misses the floats. I had a wonderful time at B2B this year. I was able to do the entire race even though I had seriously injured myself the weekend before, and the after party was even more fun. We sat drinking in the Safeway parking lot, made some random new friends, and then ended up at a hidden rave style party in Golden Gate Park. Nothing was planned and all super fun, which is my favorite kind of adventure. 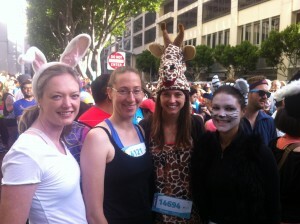 This entry was posted in San Francisco and tagged B2B, San Francisco by Tracy Tripp. Bookmark the permalink.